Terlingua Cabin Sherri est un endroit merveilleux pour se détendre et un excellent point de départ pour explorer la région de Big Bend. Vous aurez un accès rapide et facile au parc national de Big Bend, à la rivière Rio Grande, à Terlingua Ghost Town et au parc d'État de Big Bend Ranch. La cabine à distance de marche facile (1/3 mile) au célèbre La Kiva Bar and Grill. Profitez de toutes les commodités de la maison. Il y a une chambre avec un grand lit, une mezzanine (attention au plafond bas) avec deux lits jumeaux, une salle de bain, un salon et une petite cuisine. Le salon dispose d'un futon en taille réelle qui peut être fait comme un lit. Il y a une petite télévision avec un lecteur DVD intégré. Nous avons quelques DVD. N'hésitez pas à apporter le vôtre, mais vous passerez probablement plus de temps sur le porche à regarder les étoiles et Terlingua Creek. La cuisine a un réfrigérateur, micro-ondes, four grille-pain, machine à pain, petit four à convection et une cafetière. Le poêle fonctionne mais pas le four. Il y a aussi des assiettes, de l'argenterie, des verres pour votre usage. Des pots et des casseroles sont également fournis. La salle de bain est petite mais dispose d'une douche, de toilettes et d'un lavabo avec de l'eau chaude courante. La cabine est refroidie et chauffée par deux mini systèmes de climatisation split. La cabane Terlingua de Sherri est située sur une falaise au-dessus d'une section alimentée par la source du ruisseau Terlingua. La plupart du temps, il n'y a qu'un ou deux pieds d'eau dans cette section du ruisseau. Mais quand il pleut, il peut devenir un torrent furieux dans le canyon au-dessous de la cabane. Faites attention près du bord de la falaise. Le sol peut changer dangereusement et de façon inattendue. Pas d'animaux de compagnie. Les enfants de moins de 12 ans ne sont pas autorisés dans la cabine. This is not a cabin in the wilderness but it is a wonderful cabin. Our first night, sitting on the porch, a road runner ran by, doves flew around, lesser goldfinch were in a tree down in the wash and a verdin (a small bird) landed in a bush just off the porch. The sunrises were nice and the sunsets, too. Inside, everything was in order. A few notes left for guests solved any problems that we had. We had some hot days and the air conditioning (or just sitting on the porch) made things pleasant. We also had some cold days, with temperatures in the 60's and the heating system kept us warm. It is a well furnished cabin, enough room to spread out things and I recommend it strongly. As indicted in the information provided, the Cottonwood store has an amazing variety of food if you need anything. It is also close to the rafting companies (we enjoyed our trip with Far Flung) and it is basically at the doorstep to Big Bend National Park. We enjoyed our stay. Sherri’s cabin is in a fantastic elevated position overlooking the creek and around 5 miles from Terilingua ghost town. Across the creek is La Kiva bar and restaurant and on the opposite side of the road is a wonderful art gallery. We enjoyed 2 nights stargazing and enjoying the quiet and peacefulness if the area. The cabin is fully equipped with everything that you could possibly need but there is a shop a few minutes drive away if you need anything. The cabin was sparkling clean with towels and toiletries. We would definitely stay again if we are in the area. 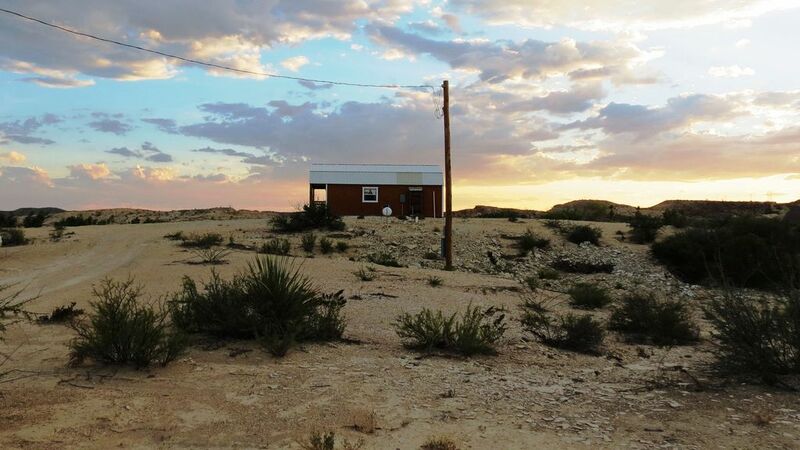 Cute cabin in a great certral location, easy access to Big Bend and great restaurants! Would definitely stay here again. It was clean, cozy, it had everything we would need! This cabin is exactly as described. It's a great little cozy cabin and had everything we needed. My 12 year old boys loved the loft. It was a perfect location for getting into the park. We brought our zero gravity chairs and looked at stars late at night. We can't wait to visit the park again and we would rent this cabin again for sure. We stayed a week in Sherri's cabin. Here are my observations. 2. Property managers were very responsive to a small issue we had with climate control and got it rectified immediately. 6. Interesting but functional closet for hanging clothes. 1. The shower is small but you can really consider this a "tiny house" and shouldn't expect much more. 2. The bed! I had read earlier reviews that the bed was bad, but the property managers had reported that the bed was to be replaced soon. I was hoping that the replacement would happen before we got there. I woke up with a back ache every morning until I started sleeping on the futon in the common area. The bed simply has no support. I contacted the property manager after our visit to talk about the bed and was informed that it was, in fact, a new bed. The owner of the property had recently put a new memory foam bed into the cottage. My only response was wow! One or both of two things has happened. The bed that was purchased was a cheap, inferior memory foam model and/or there was not a solid support between the mattress and the box springs. I regularly sleep on a memory foam bed at home. When it was installed, we were told to put 3/4" plywood between the mattress and the box springs because memory foam needs the support and box springs do not provide enough. Mine is great! Would I rent this again, probably not, simply because of the bed. Otherwise, yes. We are not quite sure how to respond to George's comments about the bed. This is the exact same, high quality, memory foam mattress and support system that we use at about half of our 31 vacation rentals. It has been highly praised by other guests at this property and other properties. This is our very first complaint about this brand/style of mattress and support system after years of using the same type of mattress at several properties. Other guests at this particular property have loved it. No pets or children under the age of 16 are allowed at the cabin. Our cancellation policy is if you cancel before 30 days of your stay, then we will refund 100% minus a $50 cancellation fee and any processing fees. If you cancel within 30 days of your stay, then a refund will depend on us being able to re-rent that time. This supersedes the cancellation policy that VRBO has on it's drop down box. Rates are subject to change until payment has been received.